As you have probably noticed, I am obsessed with all things beach house lately. Sorry– I’m probably boring some of you!! But in preparing for our next beach trip where we will be entertaining our biggest crowd yet. I thought it might be interesting (and of more general interest) to share a typical menu plan for times when I’m feeding a bunch of people with various eating styles for several days in a row. I’ve found that the best meals are the flexible ones– ones that people can fine tune for themselves as they serve up. And often these types of menus tend to be the easiest for me to pull together as well. So here, for anyone entertaining this summer, or the next holiday, or maybe on a camping trip, is a week of easy meals for easy entertaining. We make most breakfasts DIY. I make sure we have fixings for cereal, eggs and toast, yogurt, and instant oatmeal, and leave the type and timing of breakfast up to everyone else. Usually every few days I will supply something sweet, like muffins or cinnamon rolls, to supplement the DIY morning offerings, and usually at least once on a trip John or I will serve pancakes and bacon. But mostly breakfast is on your own. Lunches are a mix. Sometimes I will do soup, salad and bread. Other times I will set sandwich fixings alongside whatever leftovers are around from other days of meals. 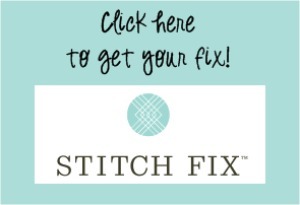 This will again give folks flexibility to choose what sounds good to them, and also is economical by offering extras from other days for folks to finish up. Dinners are where I tend to spend the most time, though many meals still have a DIY element so that people can customize their dinner for what they most enjoy. Here’s a typical week of dinners for a crowd. #1– Taco bar. Cook up some hamburger with an onion, a generous mash of garlic and some taco seasoning. (I usually do this before the trip to decrease vacation kitchen time. Then I freeze it to add a cold item for the cooler on the drive over.) When serving, add tortillas and taco chips and all sorts of other fillings (homemade guacamole if I have avocados on hand) and let folks make their tacos as they like them. #2- Clam chowder and fresh biscuits. I like to have at least one meal at the beach feel like proper beach fare, and clam chowder is a great affordable thing to make for a crowd. I don’t have my exact recipe written out (and sometimes I even buy canned) but you can use this recipe and substitute canned or fresh clams instead of chicken. You can even do it in the crock pot ahead of time if you know you’ll be busy all afternoon. And then biscuits–who doesn’t love biscuits? #3– Chili and cornbread. I plan this strategically AFTER taco night, so I can toss the leftover taco meat into the chili pot along with a bunch of cans of beans and tomatoes. Here’s one recipe that I like, but I sometimes make it with fewer ingredients and it still turns out fine. This is wonderful with cornbread (or perhaps leftover biscuits) served with honey or jam. Yum. #4- Baked potato bar. This meal comes strategically after chili night, because lots of folks like chili with their baked potatoes. Add in ham and cheese, butter, sour cream, and a nice salad, and you havve a whole meal for just a few minutes of prep. And again, it’s a meal people can customize as they see fit. Sure to be a crowd pleaser. #5– Pizza night. I make homemade crust right after lunch and let it rise all afternoon. At dinner time people gather in the kitchen with an assortment of pie pans or throw-away tins. They spread crust onto pans and top pizzas as they wish. Our favorites are pepperoni, sausage, cheese, peppers, mushrooms, and cream cheese (this last one spread in little dabs across the top.). Again, because folks are choosing toppings for themselves, they get what they want, and most people really enjoy doing pizzas for themselves, especially once they see how easy it can be! #6- Chicken enchiladas. Here’s my favorite recipe. 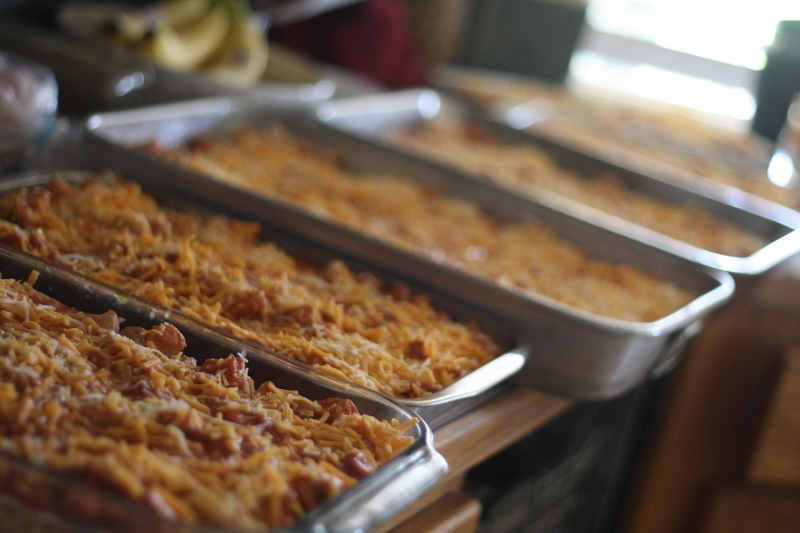 I usually make a couple casseroles before a trip and pack it over frozen in the cooler. I’ve listed this one out of order, but it is likely to be served one of the very first nights, since it will be half thawed by the time we arrive. I usually serve these with salad, sour cream, chips and salsa on the side. 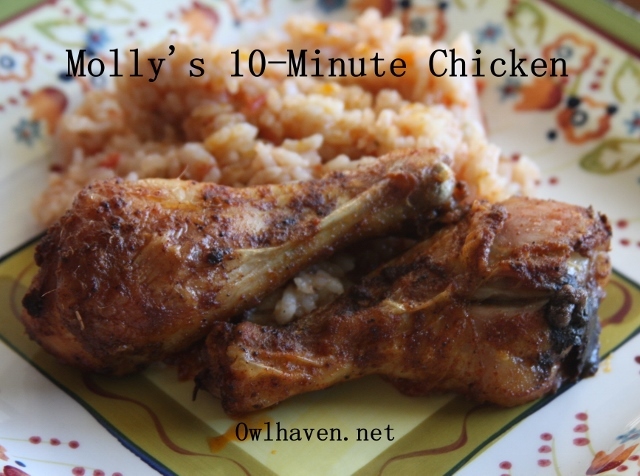 #7- Molly’s 10 Minute Chicken— This is a great easy chicken recipe that tends to please a crowd. You can make it with just legs, or a mix of legs and thighs to suit different appetites. I will serve it with bread and salad, or maybe even homemade mac and cheese if I’m feeling ambitious. What about you? What are some of your favorite meals to serve when you’re entertaining? I would love to hear your best ideas! Burrito Bowls (Chipotle inspired). Rice, black beans, meat (grilled steak, chicken, or carnitas are good options), salsa, guacamole, lettuce, grilled onions and peppers, sour cream, cheese and tortilla chips. It’s always a hit and works for meat lovers and vegetarians. Have you tried the tray roasting method for big crowds? I find that most people like chicken and rice. Just roast several whole chickens,along with some veggies (or you could cut them up before) and cook a big pot of rice. That way dark and white meat people both get the cut they prefer. ( I’m a wing person myself!) supplement with salad, bread and the meal is complete! You can of course vary the spices and make it Asian, Latin, or whatever you prefer.